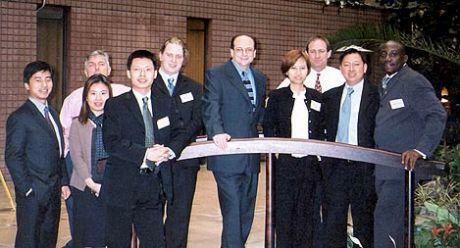 We held our first Annual Network Meeting on 25 February 2002 at the Skyline Sheraton Hotel in London. Our founding Members, Edgar and David from UFO Shanghai, Grace from UFO Hong Kong, Michel from UFO France, Dorothy from UFO Singapore, David from UFO New York, Philip from UFO Great Britina, Mervin from UFO Malaysia and Oluwole from UFO Nigeria attended the event. The Agenda included an opportunity for our founding Members to give presentations on their companies including background, structure, scope of services and also the specific customs regulations relating to their countries. Discussions also took place regarding customer service and marketing. These sessions were a great opportunity for key managers to share their wealth of knowledge and experience. This was a landmark meeting and the first chance that UFO Members had to meet and discuss business on a personal level.